Tents are excellent ways of experiencing the Toronto outdoors along with being pocket-friendly. They are extremely functional and are able to jazz up your wedding. However, if you are planning the matrimony in summer of 2017, a few factors need to be kept in mind for you to enjoy the magic of tent-wedding. Weather plays a major role in overall pulse of the wedding. For instance, rain is often accompanied with high winds thus causing the tent to tilt over. Check the weather forecasts and get a tent that is able to withstand all sorts of weather. The wedding planner ensures everything falls into place without any hurdles. Summer weddings that involve tents go through a complicated set-up outside. A planner brings along varied experiences. Caterers should have the ability of seamless work with every wedding vendor owing to the strong reputation they have built. Efficient summer wedding catering implicates detailing every dish; from the appetizers to desserts. The caterer should be able to envision how the garnish fits with the food they serve. The space must be large enough to accommodate all your guests comfortably. Will you need more than one tent? Will there be ample space for kids to have fun without bothering the elders? How will you display the food? These are important questions one has to figure out before hand. Plan ahead and think of all possible outcomes to avoid last minute issues. Wedding planners are meant to ensure couples are at ease and all the heavy jobs are done the day before. Ask them questions and understand their process of work; this keeps you up-to-date throughout your own wedding details. Come summer and bugs can be found just everywhere. Moths, bees and mosquitoes are just around galore. Have proper pest control measures undertaken both inside and outside the tent. Outdoor weddings have a certain charm. They offer greater space and flexibility for their guests. The kids will want to run around, so have enough space for them and arrange some items for them to savor. 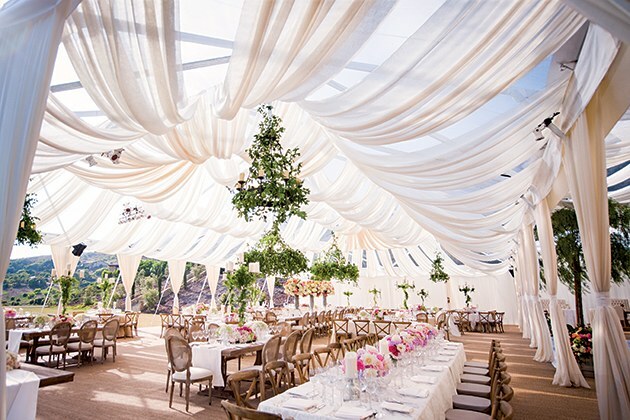 Just because it is a tent wedding, do not over-do the decorations and lighting. Keep everything elegant, mollifying and yet amazing; something really classy for the guests to speak about, even after attending several weddings after yours. Still wish to have something else for a memorable outdoor wedding? Let us know.